Jan. 31 /CSRwire/ - New York, NY – January 31, 2008 - New York State has filed lawsuits against at least three companies for groundwater and soil contamination that they attribute to perc, the dry cleaning chemical perchloroethylene (PCE) used by over 90% of all drycleaners. In California and recently proposed in New Jersey, the use of perc in dry cleaning will be outlawed within the decade. Not only bad for your health, it turns out that harsh dry cleaning chemicals and traditional finishing methods can also be harmful to clothing by dulling the finish, breaking fibers and leaving residues on the garments. The timing couldn't be better for health conscious Green Apple Cleaners, the only environmentally friendly dry cleaner in Manhattan. At the Green Apple Cleaners plant in New Jersey, trained specialists using state-of-the-art CO2, Wet Cleaning and European Finishing equipment, treat garments with gentle handling. The special care they give to the clothes, and to the customers, has been recognized by Green Apple Cleaners' acceptance into the elite group of prestigious cleaners - "America's Best Cleaners(TM)". Their care for the planet has placed them among New York's top green businesses and they are one of the founding members of the Sustainable Business Network of New York. Taking care of the environment was the brainstorm of entrepreneur David Kistner and his partner Christopher Skelley who founded the business in 2006. When Mr. Kistner's wife announced they were having twins four years ago, he vowed to keep hazardous chemicals not only out of reach, but also out of their home. In searching for safer dry cleaning in New York, he found no alternative solutions. Two years later, Green Apple Cleaners is now servicing over 450 buildings in Manhattan and over 9,000 clients, including the big apple's most celebrated personalities. Though the bulk of their business is pickup and delivery, they have already added two storefront locations last year with four more planned for 2008. 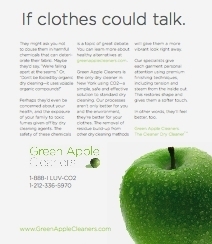 The popularity of Green Apple Cleaners is a sign that New York City is serious about going green. Another boost for the brand is that more people are catching on to the misleading "organic" signs cropping up on dry cleaning windows all over town. As the CEO and founder David Kistner says, "If clothes could talk they'd tell you that "organic" means volatile organic compounds – pretty tricky!" On another environmental front, Mayor Bloomberg's new plastic bag recycling law will require over 2,000 stores in Manhattan, including many large dry cleaning operations, to take responsibility for their plastic bags. "It is important to take as many steps as we can to recycle plastic bags," Bloomberg says. "They are not biodegradable, but instead break down into small pieces that pollute the water and soil. Due to their light weight, plastic bags can easily escape from our sanitation system..." Green Apple Cleaners supports waste reduction with its signature black garment bags used to transport dry cleaning to and from their customers in eco-friendly vehicles. Any disposable bags they use are 100% biodegradable.